Christ Washing His Disciples' Feet, Wissington, Suffolk, 13th century. Medieval Wall Painting in the English Parish Church. Scenes from the Life of Christ: 14. Washing of Feet, Giotto di Bondone, 1304-1306. Washing of the Feet, Duccio di Buoninsegna, 1308-11. Web Gallery of Art. Washing of Feet, Little Tey, Essex, 14??. Medieval Wall Painting in the English Parish Church. Washing of Feet, Crostwight, Norfolk, 14??/15??. Medieval Wall Painting in the English Parish Church. Christ Washing the Feet of the Disciples, Tintoretto, 1547. Prado Museum, Madrid. Jesus Washing Peter's Feet at the Last Supper, Ford Madox Brown, 1865. Art Magick. Jesus Washes Peter's Feet, Watanabe, 1982. Pacific Asian American Center for Theology and Strategies. Prints Available. Washing of the Feet, John August Swanson, 1989. The Washing of the Feet, The Life of Saint Peter, Bertrand Bahuet. Fresco 1995-1996. Le lavement des pieds, Corinne Vonaesch, 2001. "Washing of the Feet", Figural series by Leszek Forczek, commissioned by the Bishop of Santa Rosa. Contemporary. Washing their Feet - Carole Lombard, Ginger Rogers, "Hymn to Her," collage by Karen Whitehill, contemporary. The Washing of the Feet, Ghislaine Howard, 2004. The Methodist Church Collection of Modern Christian Art. Use of images. Moon, Dove and the Footwasher, Foot Washer: Number 1, Foot Washer: Number 3, Foot Washer: Number 4, Foot Washer: Number 5, Foot Washer: Number 6, Daniel Bonnell, contemporary. Purchase and Use. St Augustine Washing the Feet of the Redeemer, Guercino. Web Gallery of Art. The Washing of the Feet, African Mafa. Christ Washing Disciples' Feet, Alphonso Doss, India. Asian Christian Art Association. Washing Feet, Jyoti Sahi, India. Asian Christian Art Association. Washing the Disciples Feet, Watanabe. Pacific Asian American Center for Theology and Strategies. Prints Available. 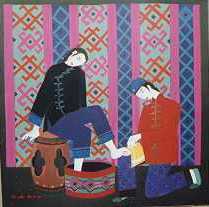 Washing Disciples Feet, Lu Lan, contemporary. Lu Lan's Paintings. Jesus Washing the Feet of the Disciples, Tiffany Studios, Union Congregational Church, Montclair, NJ. stainedglassphotography.com.